Each city has its own development rhythm. Buildings are constructed then subsequently modified or added on to. Sometimes the buildings are torn down to make way for newer buildings. In some cities (think Florence, Italy) the rhythm is very slow. In other cities (Hong Kong!) one can be surprised by how staccato the rhythm is. Here in Bangkok, it is somewhat in between, though closer to Hong Kong than Florence. 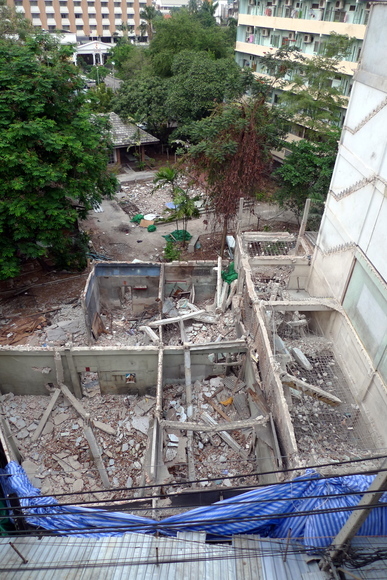 A few weeks ago, I noticed that a pair of shophouses adjacent to the Thong Lo Skytrain station (the one at the mouth of our soi) were being demolished. The process took several days and was done largely by hand – laborers with sledgehammers started at the top of the building and deconstructed it, floor by floor. Interestingly, they are not removing the entire row of identical shophouses, just these two. The demolition process exposes the intimate way in which the buildings are connected: ghosts of the back stairs can be seen on the wall of the remaining shophouse. People are apparently still living next door to the demolished buildings: laundry is hanging on the roof area and tarps have been raised to keep the dust out. The demolition also exposed a large open space that I never knew existed behind these buildings. It looks like there may have been a small pool back there. As of yet, there are no signs announcing what is to happen with this space. The house to the left is a large private home on a lot covered with a pond and lots of old trees. Behind the open space is a large but shadowy hotel (the orange building) and to the right is an apartment complex (in green). I would guess that these shop houses probably date to around the 1960s so they are being replaced within three generations. I look forward to seeing what development happens here. It seems too small for a condo – lord knows we have plenty of those sprouting up all around Thong Lo station! – but stranger things have happened. This entry was posted in Uncategorized and tagged Bangkok, Building, Chophouse, Construction, Design, Krungthep, Landuse, planning, Shophouse, ThongLo, ThongLor, urban by christao408. Bookmark the permalink. It always amazes me how fast the turnover of buildings is here in Asia. Back home, even buildings from the 1960s are sometimes already under conservation protection (and the 1960s really didn’t produce anything pretty). 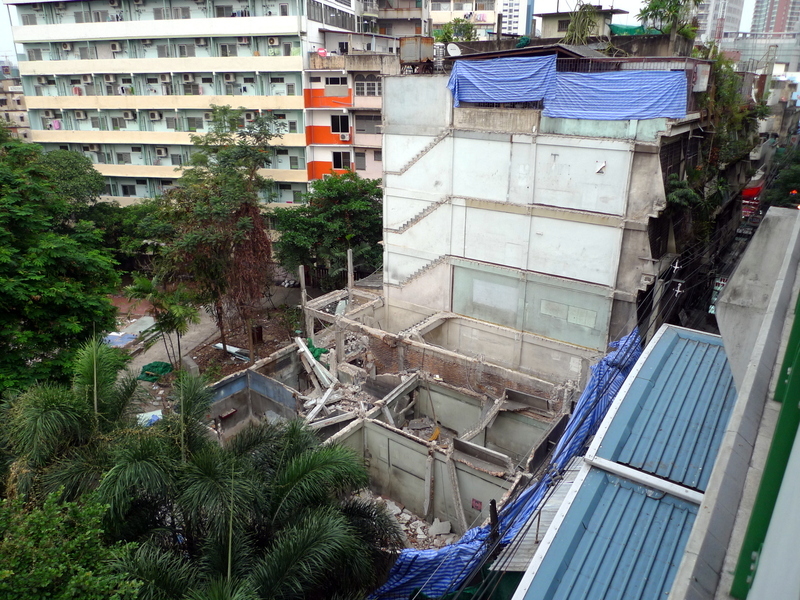 Buildings having historical value are not demolished in Hong Kong. Other old buildings should be demolished for safety reasons or for other reasons such as rebuilding a building with more floor area. I have a feeling, my fine friend, that a new restaurant is in the works. Where you and your buddies will once again experience paradise in the stomach and gain weight in the process. Probably another high end condominium? I wonder how much time will it take them to finish, if they were to build something in that space again. I hate to see it happen here. Small sections of an area and up goes a condo. Fortunately,the historical society keeps an eye on our historical buildings. If it’s another condo, then I think it’s going to have too many people in a small area all breathing down each other’s necks. Were the previous building unoccupied? What happened to the previous occupants is hard to answer. I suppose if they made a huge protest then you might know. Hard to also see if that was a pond or a planter. I barely make out pool furniture though. It would be nice if they just turn it into a small park. But I doubt that will happen. Maybe a mixed low rise or a community centre type building would be good. i think a demolition for more greenery would be a welcoming sight for the area. as buildings there are basically back to back and side to side.